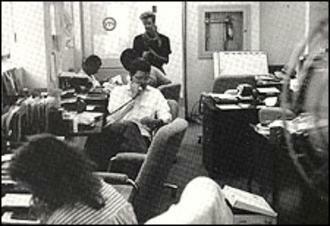 YTV's first office (Rob, center) shows Rob knows how to grow a big success out of a modest start. Rob makes good things happen with people skills acquired over years of volunteer work as a coach and convenor, and as the entrepreneur who created YTV and its nationwide consortium of investors who made it possible. As a business leader, Rob has management skills honed in a business career in media. As an environmental leader, Rob has environmental awareness developed through a lifetime of environmental activity and concern. As a community leader, Rob has awareness of community needs from many years as president of a long-active Oakville ratepayer group and as coach, convenor and director of Oakville sports groups. As a political leader, Rob listens. Rob knows that it is Councillors who move and second and vote resolutions up or down, not the mayor. Rob believes in consensus-seeking discussions to find the common points of agreement and action. Rob Burton’s background in journalism, business and public service coupled with his lifelong passion for preserving and enhancing the environment have served him well in the role of Mayor of Oakville. Rob's experience as a journalist gives him the communication skills to raise public engagement to a level never seen before in Oakville or anywhere else. His experience in business gave him the skills to manage a multi-faceted corporation – the Town of Oakville – in a complex world. His experience as a volunteer gave him first-hand understanding of the needs of children and families. He has filled leadership roles with national professional organizations, provincial boards, and arts, environmental, civic and sports groups. He holds a Master of Science degree from Columbia University. Rob began his television career in journalism in 1972. He immigrated to Canada and became a Canadian citizen after being recruited by the CBC to help start the world's first consumer journalism show - Marketplace. After Marketplace, he produced public affairs TV shows for CBC and CTV. He was a member of the Parliamentary Press Gallery in Ottawa, news producer of the CBC Eastern Ontario Regional TV station in Ottawa and an award-winning documentary film-maker before shifting to the entertainment side of the industry. Moving to entertainment, Rob produced several seasons worth of "Alfred Hitchcock Presents" for Universal Studios and helped produce the classic children's TV comedy show "You Can't Do That On Television." He was managing director of Nelvana Canada, the noted animation company. Rob capped a successful career in film and TV by creating YTV. After winning the license for YTV, he served as the general manager and vice-president of programming and production, implementing the business plan he wrote and helping put YTV in the black ahead of plan. He later moved to the board of directors of YTV after the network was successfully established. His personal lifetime favourite project was “They Went to Fight for Freedom,” a film he made with Lorne Green to commemorate the sacrifice and success of Canada's veterans in World War II. Rob also served on the National Executive of the Directors Guild of Canada and the Canadian Film and Television Production Association. He also led the DGC's creation of its labour-sponsored venture capital firm, Entertainment Ventures. Rob led successful film & television industry efforts to create a master labour agreement and restore provincial tax credits that made possible the economic boom of the '80s and '90s in film and TV. Rob’s passion for the environment goes back to his days as a Scout, where he learned to “Always leave your campsite better than you found it” and made the principle part of his attitude towards public service. During his university days, he organized the first international students' conference on the ecology, just ahead of the first Earth Day. His master’s thesis tied together the effects of air pollution on health and was presented at the U.N.'s first international conference on the environment in Stockholm. In 1974, as a young TV reporter, Rob did the first story on acid rain in Canada. Rob co-chairs the Ontario Municipal Leaders for the Greenbelt, too. 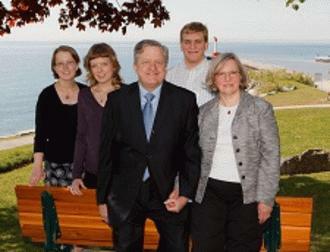 In 1994, Rob and his wife Wendy moved their family to Oakville where they were quickly drawn to community service. Rob became the Joshua Creek residents' association's newsletter editor and president. In that role, he participated in several Ontario Municipal Board cases, helping to win all of them. Rob also served as a manager, coach, convener and board member for the Minor Oaks Hockey Association for 12 years. He sat on the Oakville Galleries and the Oakville Library boards and was a member of the Town of Oakville's Task Force on Intensification, Renewal, and Redevelopment for Kerr Street. Kerr Street's renaissance has come from the policies recommended by the task force. In 2000, Rob created and led a coalition of Oakville and Mississauga residents' associations that won environmental protection for residents from a 900-megawatt electricity generation station planned for the border of the two cities and a couple of years later prevented another power plant in northwest Oakville. This coalition also challenged developers and the Town of Oakville at the Ontario Municipal Board after developers appealed Official Plan Amendment 198 to remove green policies from the plans to urbanize North Oakville. He negotiated a settlement to the case that saved the policies to create the Natural Heritage System across north Oakville and created the Oakville Environmental Fund -- and saved the Town's taxpayers millions of dollars in costs. After leading successful citizen-group fights without Town support against the two attempts before 2010 to put power plants in Oakville and leading the successful battle at the Ontario Municipal Board to save environmental lands north of Dundas, Rob first ran for mayor in 2003, losing by 28 votes. 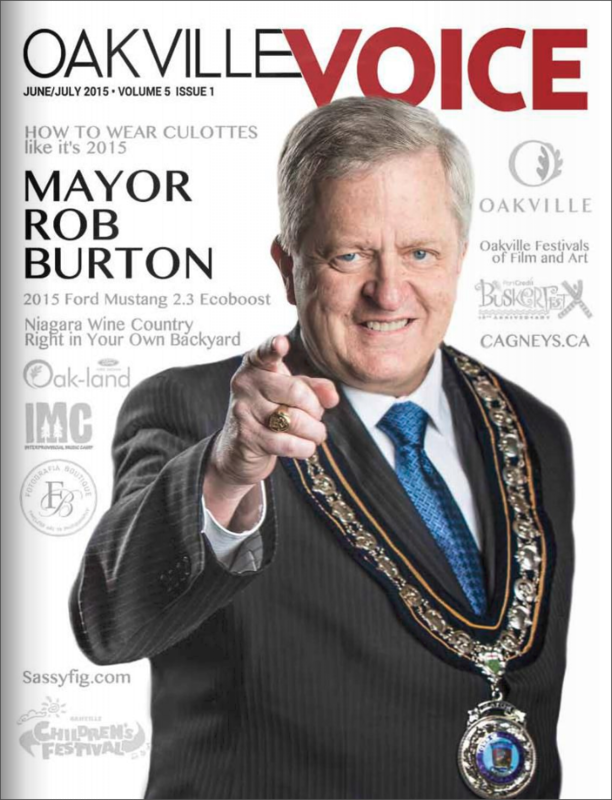 In 2006, Oakville residents chose Rob Burton as their mayor with a mandate to make the Town the most livable community in Canada by controlling growth, debt and taxes, saving green space, and catching up on long-overdue facilities. Rob serves on the board of directors for the Halton Regional Police Service (where he is chair), Oakville Hydro, Halton Healthcare Services, and he is president of the Halton Community Housing Corporation. He served for five years on the board of the Halton Children’s Aid Society. He also was appointed for two terms on the GO Transit board, where he was the only member who regularly used the GO trains and buses to get to meetings. In 2010, Oakville voters returned Rob as Mayor with 52% of the vote, to 42% for the second place candidate, former mayor Ann Mulvale (her second defeat). With Oakville's leadership role in urban forestry becoming widely appreciated in Canada, Tree Canada added Rob to its board of directors. In 2014, Oakville voters chose Rob for a third term as Mayor with 67% of the vote. Meanwhile, Mrs. Mulvale lost again in 2014, this time in an attempt to unseat her longtime colleague and friend, Ward 5 Councillor Jeff Knoll. She wrote to him to say they'd never been friends, "only a mutually convenient political alliance". Rob and his wife, Wendy, a PhD in urban geography from the University of Toronto, have been married and raising their family together for 43 years. They have three children - Rachel, a health policy analyst; Sarah, a musician, and Robbie, a university graduate student. Raised in a military family who moved every three years or so as his father was moved to new assignments around the world, Rob has lived in Oakville longer than he's lived anywhere else and calls Oakville the hometown he always wanted.